So #WrongWayJay is trying everything he can to make the Missouri Department of Revenue scandal go away. Unfortunately, the incompetence he shows in running a State is just that much more glaringly obvious when trying to run a crisis of mismanagement. Though plenty has already been written about this scandal, the latest word was that Jay Nixon had handed down the word to all DoR offices that the scanning of CCW info ONLY was to stop immediately. The DoR will continue to scan and forward your other personal, confidential documents to the "magical database" in some other state. Unfortunately, I was told this morning, apparently some offices haven't gotten the memo as of yet. They continue to scan and retain all documents-sending them out of town. 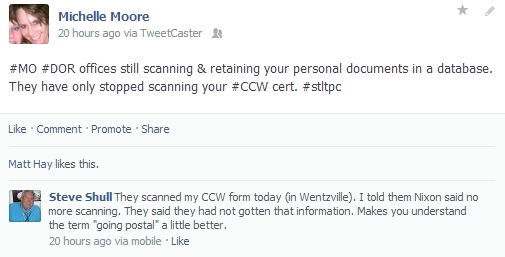 Additionally, they are apparently still scanning CCW certs in order to process them. This is this is completely against the directive ordered by Nixon, and completely contrary to State law concerning CCW information. Is the list of carrying concealed endorsement holders a public record? The Conceal Carry law further defines who and under what circumstances any other agency may request access to your CCW information-and it's not to request the entire database of CCW holders who have committed no crime. 8. The sheriff shall keep a record of all applications for a certificate of qualification for a concealed carry endorsement and his or her action thereon. The sheriff shall report the issuance of a certificate of qualification to the Missouri uniform law enforcement system. All information on any such certificate that is protected information on any driver's or nondriver's license shall have the same personal protection for purposes of sections 571.101 to 571.121. An applicant's status as a holder of a certificate of qualification or a concealed carry endorsement shall not be public information and shall be considered personal protected information. Any person who violates the provisions of this subsection by disclosing protected information shall be guilty of a class A misdemeanor.9. Information regarding any holder of a certificate of qualification or a concealed carry endorsement is a closed record. Once again the Administration of this State cares nothing for the people who live here, but only for furthering their own political goals. If Wrong Way Jay can't follow the Missouri Constitution and statutes, then impeachment proceedings should begin to remove him from office. He is the governor of the Sovereign State of Missouri, not an employee of the Obama Administration.